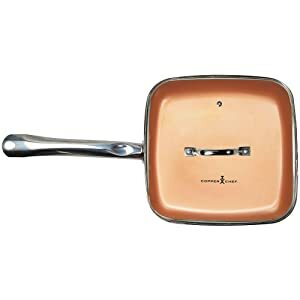 Cerami-Tech Technology with 5 layer construction means nothing sticks to the surface of the pan, making clean up a breeze. Less Fat - Fewer Calories - No Guilt. Mouthwatering meals are effortless without added fats, an ideal choice for healthy cooking every day. 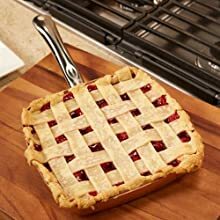 The unique square design gives up to 25% more room to cook vs. ordinary round pans. Tempered Glass Lid oven safe up to 500°. The breakthrough, all-in-one kitchen miracle: bake, fry, broil and saute! 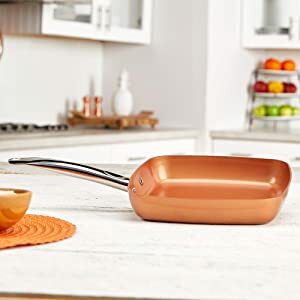 Copper Chef's Cerami-Tech Non-Stick Technology lets you cook without added oils and easy clean-up. Frying foods has never been easier. With even heat distribution, food will be perfectly browned and crispy. The Copper Chef's special design allows you to drain off excess oil for crispy results without all the grease. Copper Chef works on all stovetops and is heat resistant up to 850°. From stovetop to oven to tabletop, Copper Chef will simplify your kitchen. With Copper Chef's square design, large cooking capacity, and even heat distribution you will enjoy perfectly cooked meals from oven to table. 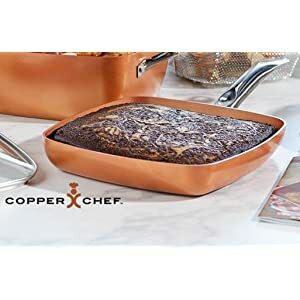 The award-winning Copper Chef is unique and versatile. From its functionality to design, Copper Chef is the perfect addition to your kitchen. 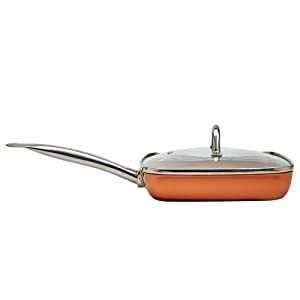 With over 1 million Copper Chef pans sold, kitchens across the world are gleaming with Copper. The square shape is bigger allowing more food to be cooked at once. 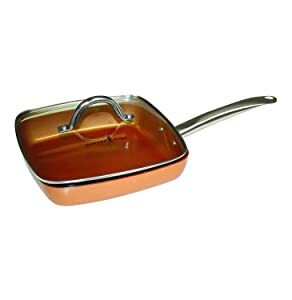 Where only three chicken breasts or pork chops, for instance, might fit in a round pan, this pan fits a full four (or more) making it easier and more efficient to cook for an entire family. One of the things my customers always seem to want is to pare down the number of pots and pans they have in their kitchen cabinets. So we brought you a square frying pan that replaces most other pans in the kitchen. 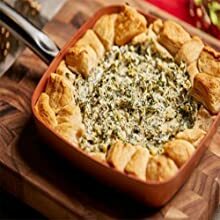 It is not too heavy, free from harmful chemicals, nonstick for easy clean-up, and can stand up to the rigors of the hot oven. Copper Chef can be a workhorse in your kitchen. Succulent, home-cooked meals without added fats or oils are fast & easy. Goes from any stovetop to oven to table with 850° F heat resistance. Stainless steel induction plate gives you superior heat conduction and perfect, even cooking every single time. Perfect for any cooking surface: electric, gas, ceramic, or induction. Includes tempered glass lid. 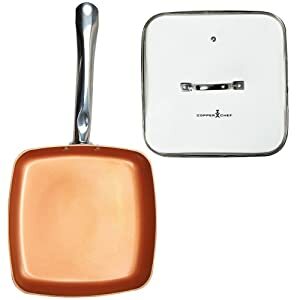 Copper Chef simplifies your culinary life! Are you looking for the one pan to replace them all? 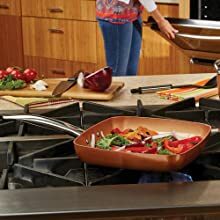 Are you looking for a safe and healthy way to enjoy the ease and versatility of non-stick cookware? 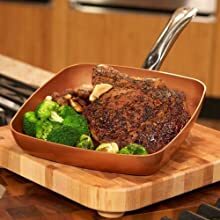 From stovetop to oven, to tabletop Copper Chef will outperform every time, with its impressive heat distribution, and Cerami-Tech coating the stickiest of meals will slide right off and wipe right out. What's In Your Kitchen?